A step-by-step LinkedIn hack that will connect you to the decision-makers who can get you the interview. When I was looking for a job, I got creative in how I went about it. I realized VERY quickly that simply applying to a position via LinkedIn wasn’t going to cut it. You see the stats… “357 people have applied to this job”. That means the odds of you getting noticed and moving on to the next round are slim at best. I had a conversation with my good friend Rob Bedard the other day which reminded me of how useful the hack that I used actually is. After being a stay at home dad for some time now, Rob is looking to get back to work doing what he loves. As someone who’s been out of the game for a little while, he’s looking for any way to have a competitive advantage over other applicants. I’m confident that when he gets the interview, he’ll be all set (on a side note, I’ve always looked up to his work ethic. I remember when I first started working with him back in 2004 I couldn’t believe how fast he moved. When I asked him about it, he coyly answered, ‘I like to move with a purpose’. I’ve always thought that was pretty cool). But he has to get the interview, which is not an easy task. 2. When you click on the job, it will have the company name hyperlinked to the company’s LinkedIn page. For this example, I’m going to be applying to the Senior Copywriter position at Blast Radius. Click on that link to take you to the company page (highlighted below). 3. Once you get to the company page, you’ll see on the right an option to check out some people who currently work at Blast Radius (and hopefully not a broken link, come on BR!). Click on that to see employees who work at Blast Radius. 4. It’s going to take you to a page that looks something like the photo below. Spend some time going through the list and find a title as high-up in the organization as possible. 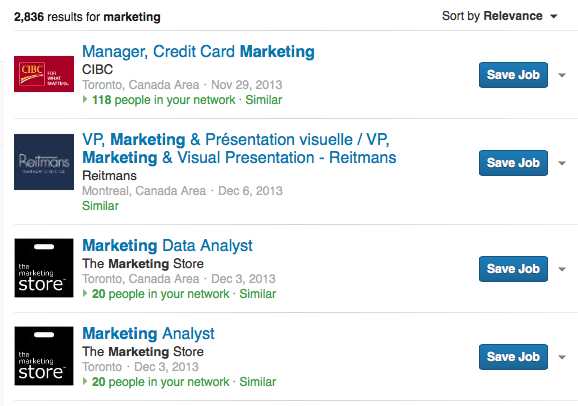 CEO, CCO, CMO, Director of Human Resources, all good titles to look for. In this example, I’m going to pick on Minda S. to be the person who I want to email (sorry if you start getting blasted with emails Minda :]). 5. Here is where you become a serious sleuth. You’re going to go to the company website and double-check the domain name for the organization’s email addresses. 99.9% of the time, it will be “@” and the website, but just to be completely sure, go to the “Contact Us” page and see what the generic email address is. 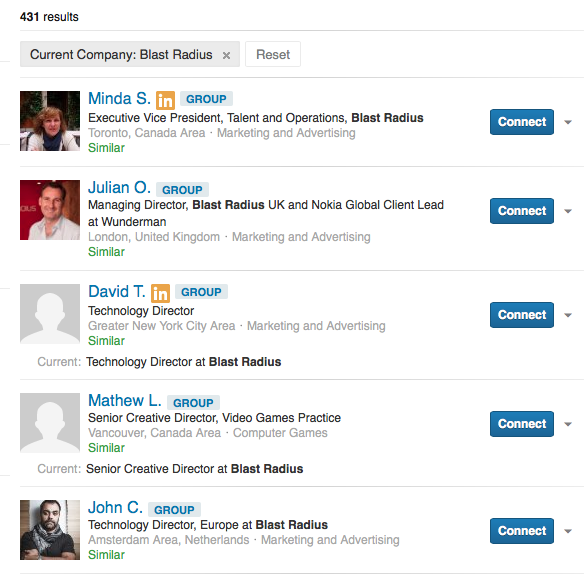 In this instance, I now know that everyone who works at Blast Radius has a domain name of “@blastradius.com”. 6. One other thing I know is that 97.5% of organizations use the “first initial, last name” format for email addresses (this is something I haveZERO data to support, just the fact that I’ve seen MANY email addresses and it is extremely rare to see a different format). Sometimes it’s first name/last name or there may be a period somewhere in it, but the odds are in your favor with the first initial last name format. So, we have Minda S. in our sights, but I don’t know her last name. I’m stuck, right? Not quite. You’re going to highlight Minda’s job description/company and copy it. Now head to Google and type in her first name and her position, so it should read “Minda Executive Vice President, Talent and Operations, Blast Radius.” Click enter, and watch the magic happen.7. Minda S. is actually Minda Sherman. BOOM. You are now armed with her first name, last name, and domain name with the ability to now send her a personalized email. Now you’re going to draft up a killer email to send to “msherman@blastradius.com” explaining just how badly you want to be the Senior Copywriter at Blast Radius. You’ll explain that you’ve already applied via LinkedIn, but that you’re so damn excited about the job that you wanted to email her personally. Even if Minda isn’t the exact person you need to be speaking with, she probably knows the person you should be, and this will hands down fast track you over the people who send a generic cover letter to “hr@companyx.com”. You need to differentiate yourself from the thousands of other well qualified people who are applying for the same job that you are, and this is one way to do just that. If the CEO sees an email from an ambitious person willing to go out on a limb to prove that he/she wants the job more than anyone else, they’ll be compelled to fast track you. This process will only take you so far though, it’s up to you to crush the interview.Happy trolling!